Recently I got a packet of Millet Ven Pongal Mix / Siruthaniya pongal mix & Millet Sambar rice mix from Native Food Store. I tried Pongal mix for my weekend breakfast as I got up late. Its so easy and quick to make. Our breakfast got ready under 15 minutes. This millet pongal mix is a combination of roasted moong dal, varieties of millets, pepper corns, jeera, salt and cashews. I just followed the instructions given in the pack. All we need to do is to add the mentioned amount of water and cook this mix in a pressure cooker. We can also season it with curry leaves and hing in ghee at the end to make it more flavorful. It came out very soft, flavorful & tasty just like homemade ven pongal. Sendhil & Myself loved it very much. We enjoyed it with coconut chutney. Friends, Native food store products are available online and they deliver their products all over India. I would strongly recommend to buy this pongal mix from them. I am sure you will love its taste and buy it often. Working women and bachelors can buy this product to make a quick and healthy breakfast/ dinner. 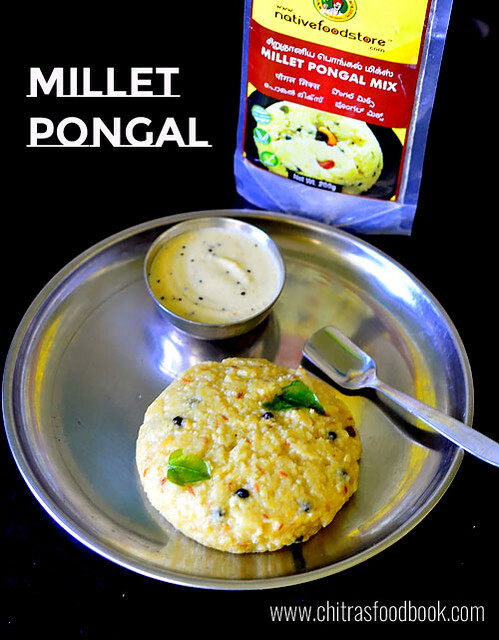 Ok, now lets see how to make Millet ven pongal using Native food store’s millet pongal mix. 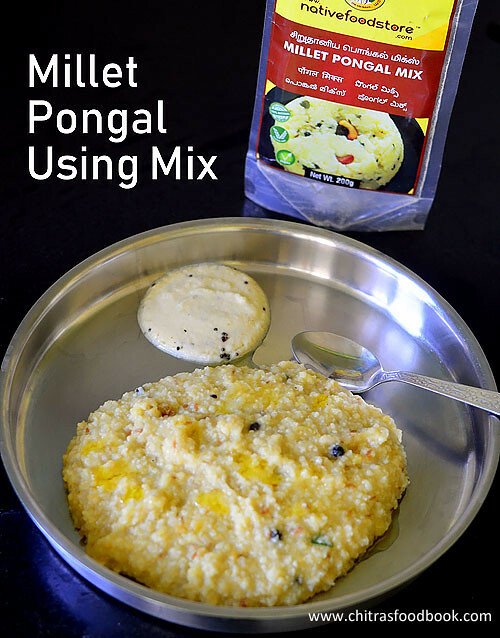 Click this link to buy millet pongal mix. Check out their varieties of millet products & rice mix, cold pressed oil in their website. Also find my post on their Millet Noodles . 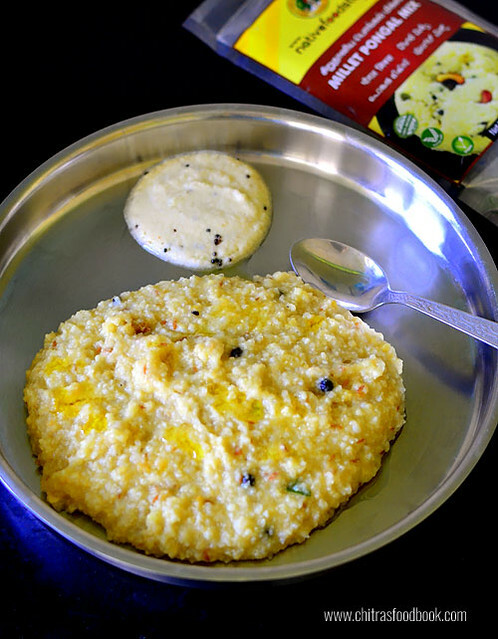 Millet Ven Pongal recipe using Pongal mix from Native food store. In a pressure cooker base, take the millet pongal mix. Add the mentioned amount of water given in the pack. Cook for 2 whistles in very low flame. Open the lid after steam is released. Mix well. Season curry leaves, ginger and hing in ghee. Add to pongal. Mix well and serve hot with coconut chutney ! Take 1 cup of pongal mix in a pressure cooker. Add 4 cups of water, mix well. Close the lid. Pressure cook in very low flame for 2 whistles. Remove the lid after steam is released. Mix well. Its consistency would be just right. Heat ghee & temper ginger bits, curry leaves & hing. Add to pongal, mix well. Serve hot immediately with coconut chutney. You can add a tsp of ghee while serving If you like. This pongal tastes very soft & flavorful ! Try this healthy, yummy, quick millet pongal with pongal mix. You will love it. Wow ! Looks so delicious !